Denhan Guaranteed Rent has been managing rental properties in the London Borough of Newham for over 15 years and our property specialists have built up excellent relationships with landlords during that time. We are one of the leading letting agents in Newham. Our knowledgeable and experienced team has an in-depth knowledge of the area. The Borough of Newham is just north of the River Thames and covers 13.98sq mi. Formed from the Essex county boroughs of East Ham and West Ham, its current population is approximately 324,000. According to the 2011 Census, Newham has the youngest population overall in the country, and is ethnically very diverse. The borough is home to London City Airport and ExCeL London. Newham is undergoing a lot of regeneration, especially around the Royal Docks. Major transport upgrades are taking place within the borough, which includes Crossrail, while the completed DLR and the Jubilee Line Extension have shortened journey times. A C2C service runs to Fenchurch Street in the City and stops at West Ham, which provides connections to the District, Jubilee, and Hammersmith & City Lines. From West Ham it is less than 10 minutes to Fenchurch Street. Routes into Central London and the City from Newham will be faster once the Crossrail project is completed in 2019, providing 24 fast trains an hour to Heathrow, Canary Wharf, and other destinations. 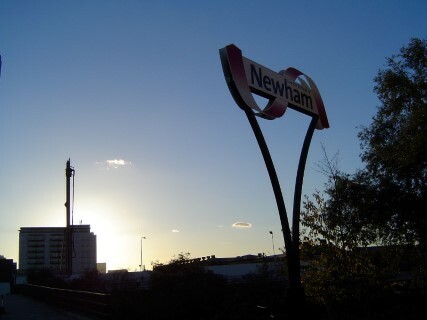 Newham has six underground stations: Canning Town, East Ham, Plaistow, Stratford, Upton Park, and West Ham. The DLR offers links to the West End, south London, the City, and London Docklands. Transport for London operates 34 bus routes in Newham, two school bus routes, and six night bus services.